Mark your calendars and plan to attend the ISPFCU Annual Meeting on Friday, June 28, 2019. The meeting will be held at Troopers Lodge #41 located at 5880 South Sixth Street in Springfield, Illinois. The Annual Meeting is an occasion for management and elected officials to report to you, the member, about important issues such as our financial position, products and services, current business issues, accomplishments of the year 2018, and future plans and goals. The meeting will begin at 11:30 a.m. with lunch being provided for all attendees. This event is free and open to all members. If you have any questions about the Annual Meeting please call us at 800-255-0886. We look forward to seeing you there! There have been reports of a scam involving Internet browser pop-ups urging users to have their credit checked due to recent data breaches from Fiserv or Heathcare.gov. To make this scam even more convincing, these pop-ups may contain the name of a financial institution you do business with. If you receive a pop-up offering a free credit check, do not click on any of the links or call any phone numbers listed. You should also consider running a scan from an up-to-date virus scanner. You can take a few simple precautions to protect yourself from becoming a victim of identity theft. First, never respond to unsolicited requests for personal financial information received via phone, e-mail, text message, or any other way even if the request appears to come from a legitimate institution that you do business with. Second, always be sure of who you are dealing with. Verify contact information independently and key in web addresses yourself. Lastly, monitor your credit report regularly for signs of irregularities. Remember, ISPFCU will never contact you via text message, e-mail, phone, or any other way to ask for account numbers or passwords. If you suspect you have been a victim of identity theft, contact ISPFCU at 800-255-0886 immediately. As part of the Economic Growth, Regulatory Relief, and Consumer Protection Act enacted earlier this year, it is now free for consumers to freeze and unfreeze their credit file with all of the major national credit bureaus including Equifax, Experian, and TransUnion. A credit freeze blocks identity thieves and others from looking at private details in your consumer credit history. Once the freeze is in place, potential creditors will be unable to view or pull your credit file unless you affirmatively unfreeze or thaw it beforehand. Having a credit freeze in place does nothing to prevent you from using existing lines of credit you may already have such as a credit card or a home equity loan. To file a credit freeze you must contact each of the credit bureaus either online, by phone, or by mail. Visit the three major credit bureaus online at www.equifax.com, www.experian.com, and www.transunion.com to find contact information and for step by step instructions on how to place the credit freezes. If you have any questions about this please contact us at 800-255-0886. We are pleased to announce that you can now setup online payments to your ISPFCU loan accounts from your accounts at other financial institutions with ISPFCU’s Account to Account Transfers! You can make these transfers to your loan accounts at ISPFCU from other financial institutions free of charge within Home Branch Online. Please allow 2-3 business days for processing. You also have the ability to send money from your ISPFCU accounts to accounts at other financial institutions for the low cost of $2.50/transfer. If you are not currently signed up for Account to Account Transfers and would like to get enrolled, simply click on Account to Account transfer under the Transfer tab within Home Branch Online to start the approval process. If you have any questions about this service or need assistance getting enrolled please call us at 800-255-0886. Please note that due to recent regulatory changes the ISPFCU Remote Deposit Capture User Agreement has been updated. Effective immediately, each time you deposit a check with Remote Deposit Capture through the ISPFCU Mobile Banking App, please be sure to endorse the back of the check “For Mobile Deposit Only, ISPFCU Account #_______” or as otherwise instructed by ISPFCU. If you have any questions about this notice please call us at 800-255-0886. Now the things you love about your ISPFCU Visa Debit and Credit cards are available right on your Android™ phone with Google Pay™! Google Pay is the fast, simple way to pay with your cards in stores and online using your compatible Android device. Security and privacy is at the core of Google Pay. That’s because when you use your phone to pay in stores, Google Pay doesn’t send your actual credit or debit card number with your payment. Instead, a virtual account number is used to represent your account information so your card details stay safe. Google Pay works anywhere you see the Google Pay acceptance mark or the contactless symbol at checkout in stores. Just unlock your phone and hold it near the terminal to pay. And when shopping online with Google Pay, you can pay with a few quick clicks in apps and on the web as there is no need to enter your payment info. Adding your ISPFCU cards to Google Pay takes just a few minutes. First, download the app from Google Play™ or check to see if it’s already installed on your phone. Then, open the app and follow the onscreen instructions. Google Pay works on Android devices running KitKat 4.4 or higher. Enjoy the ease and convenience of Google Pay with your ISPFCU Visa Cards today! If you have any problems getting your ISPFCU cards added to Google Pay or if you have any questions please call us at 800-255-0886. *Android, Google Pay, and Google Play are trademarks of Google, Inc.
To apply for an ISPFCU Visa Platinum Credit Card today please call us at 800-255-0886 or apply online here. Stop paying those high interest rates and fees from other financial institution and department store credit cards and transfer your balances to an ISPFCU Visa Platinum Credit Card today! *Your APRs may vary each billing period. The ANNUAL PERCENTAGE RATE will change each month on the first day of your billing cycle. The purchase rate equals The Wall Street Journal prime plus 4.90%. The cash advance/balance transfer rate equals The Wall Street Journal prime plus 7.90%. The APR is for the Platinum Elite without rewards. Add 1.00% to the APR for Platinum Elite with rewards. 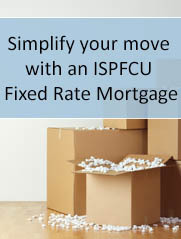 Your rate may vary based on individual creditworthiness and ISPFCU underwriting standards. Click here for complete disclosures. Have you ever considered borrowing money from ISPFCU with a Share Secured Loan? Share Secured and Share Certificate Secured Loans are available for members who are in need of funds but do not wish to deplete their savings. This type of loan allows members to borrow money by using their own savings funds at ISPFCU as collateral. As you make payments, the amount applied towards the principal of the loan is then released for immediate access. A great benefit of a Share Secured or Share Certificate Secured Loan is that you will be able to borrow money at a lower interest rate than what you could find with an unsecured loan. You will also continue to earn interest on the balance in your share account or share certificate even though there is a loan against the funds! Give us a call at 800-255-0886 with any questions you may have about an ISPFCU Share Secured or Share Certificate Secured Loan or apply for a loan online here today! To better safeguard you and your sensitive financial information, ISPFCU has implemented new member authentication procedures. If you haven’t done so already, the next time you contact ISPFCU we will ask you to submit updated information to use for verifying your identity for all transactions not done in person. Once this authentication procedure has been set you will only be asked for this information to verify your identity going forward. As of April 1, 2017, all members will be required to be verified using these new procedures for transactions not done in person. Please contact us at 800-255-0886 to submit your updated information today to make sure you have no interruption in service. The security of your sensitive financial information is very important to us. We appreciate your cooperation as we transition to these new enhanced procedures. Getting new stuff is fun. Breaking it, having it stolen, or having it stop working isn’t. By signing up for ISPFCU Club Benefits, you can gain peace of mind when shopping by having Debit Advantage coverage on your side! Debit Advantage coverage will replace, repair, or reimburse you for amounts up to the full purchase price of your new item that is broken or stolen during the first 90 days after the purchase date. Debit Advantage will also double the manufacturer’s warranty for up to a full additional year on eligible items you buy from your ISPFCU Checking Account! Debit Advantage is just one more in the long list of benefits available to you when you sign up for ISPFCU Club Benefits for the low cost of $5.00/month. We are so confident that you will find ISPFCU Club Benefits valuable that we will let you try them out for three months absolutely free! Call us at 800-255-0886 with any questions you may have and to start your free Club Benefits trial today! *Special Insurance Program Notes: The descriptions herein are summaries only. They do not include all terms, conditions, and exclusions of the policies described. Please refer to the actual policies for complete details of coverage and exclusions. Insurance is offered through the company named on the certificate of insurance. Now you can pay for college the smart way with three great repayment options and competitive interest rates! This loan is an ideal solution to help you pay for college expenses not covered by scholarships and federal loans. Learn more about Sallie Mae or apply for a student loan. Do you know someone who could benefit from belonging to ISPFCU? Could you also use some extra cash? If the answer to both of these questions is yes, then you need to check out ISPFCU’s Referral Rewards Program! For every new member you refer that joins ISPFCU we will pay you $10.00! The new member could be a friend or co-worker that is eligible to join ISPFCU through their own law enforcement employment or by being a member of your immediate family. This would include spouses, children, parents, and siblings just to name a few. You can also earn $25.00 for referring a member to open a new closed-end loan or to refinance an existing closed-end loan from another financial institution with of a balance of at least $5,000! To earn the referral reward, the person you refer needs to turn in a referral card with your name on it at account opening and the date on the card must be on or before the date the account was opened. Call us at 800-255-0886 to find out more about our Referral Rewards Program and to request your very own referral rewards cards today! Do yourself and your friends and family members a favor and direct them to ISPFCU. Did you know that you can transfer funds between your accounts at ISPFCU and your accounts at other financial institutions through Home Branch Online? With ISPFCU’s Account to Account transfers you can send money from your ISPFCU accounts to an account at another financial institution for the low cost of $2.50 or transfer money into your ISPFCU accounts from another financial institution free of charge. To start the approval process, click on Account to Account transfer under the Transfer tab within Home Branch Online. If you have any questions about this service or need assistance getting enrolled please call us at 800-255-0886. Would you like to be notified when your account falls below a certain balance or when a certain check has cleared? How about when your next loan payment is due? If so, you can set up these types of alerts and more with ISPFCU’s Account Alerts within Home Branch Online. You can choose to be notified by e-mail, text message, or both when these events take place. You can also set the alerts to occur one time or to occur on an ongoing basis. To review all the alert options available click on Account Alerts under the Accounts tab within Home Branch Online. If you have any questions about ISPFCU Account Alerts please contact us at 800-255-0886. You may hear in the news periodically that a company has been the victim of hackers who have gained access to the debit and credit card information of their recent customers. Unfortunately, these types of situations are out of our control as a financial institution. However, we can help you in the event that your debit or credit card information is ever compromised. We encourage you to regularly monitor your accounts for unusual activity and to review your statement in its entirety promptly when you receive it. If you ever notice any fraudulent charges on your ISPFCU accounts please call us at 800-255-0886 so that we can help. It is never too early to teach your children the importance of saving and financial responsibility. By opening them a Future CrimeFighter Account at ISPFCU you will help get them started down the right path to a secure financial future. Future CrimeFighter Account holders receive their own savings passbook, membership card, and stickers each time they make a deposit. In addition, Future CrimeFighter Account holders are entered into a drawing for a $25.00 deposit to their account quarterly just for using the account! If you have any questions about a Future CrimeFighter Account or if you would like to open your child an account today, please call us at 800-255-0886 or apply online here. Identity thieves are now targeting cell phone users with a scam called smishing. In smishing scams, cell phone users receive a text message that seems to come from a legitimate source, such as a financial institution. The message seeks to convince users into clicking on a link via the phones Internet connection or into calling a certain phone number. Both the link and the phone number are fraudulent and lead to a request for personal information that can be used for identity theft. Once your identity has been stolen, it generally takes much time and effort to regain your lost funds and your good name. Take a few simple precautions to protect yourself from this growing form of fraud. First, never respond to unsolicited requests for personal financial information received via text message, even if the request appears to come from a legitimate institution that you do business with. Second, always be sure of who you are dealing with. Don’t click on links in text messages or call numbers listed in text messages. Verify contact information independently and key in web addresses yourself. Lastly, monitor your credit report regularly for signs of irregularities. The warranties may be applied to any auto whether they are paid off, financed at ISPFCU, or financed by another financial institution. There are a variety of options to choose from so you are sure to find one that meets your needs and your budget. And if you act now, we will take $250.00 off the purchase price of the warranty of your choice! Call us at 800-255-0886 to learn more and to get your vehicle protected today! In the recent Future CrimeFighter quarterly drawing, James from Cantrall and Jillian from Hoffman Estates were drawn as the winners. Each won a $25.00 deposit to their Future CrimeFighter Account. Congratulations! To be eligible to win, Future CrimeFighter account holders had to make at least one deposit into their Future CrimeFighter account in the previous quarter. In the recent Student Checking quarterly drawing, Zachary from Decatur and Margaret from Rochester were drawn as the winners. Each won a $25.00 iTunes gift card. Congratulations! To be eligible to win, Student Checking account holders had to make at least one debit transaction in each month of the previous quarter. To be eligible to open a Future CrimeFighter Savings Account you must be no older than 18. To be eligible to open a Student Checking Account you must be between the ages of 16 and 22. If you are interested in opening a Future CrimeFighter Savings Account, a Student Checking Account, or both, please contact ISPFCU at 800-255-0886 or sign up online here. To avoid any inconvenience while you are vacationing or away on business, be sure you notify us when you will be traveling. As a fraud prevention measure, your debit and credit cards are monitored for unusual activity. If transactions begin to come through on your cards that are out of the ordinary, your cards may be blocked for further use. However, if you notify us in advance we can help prevent this from happening. Simply call us at 800-255-0886 and let us know where you will be traveling and the dates you will be gone. If you have any questions in regards to this procedure please contact us for more information. Try ISPFCU Club Benefits for Three Months Free! ISPFCU would like to offer our members the opportunity to try out our Club Benefits at no cost to them. We are so confident that you will find them valuable that we will let you try them out for three months absolutely free. If after the three months has passed you decide you would like to cancel, simply notify us and we will remove you with no questions asked. If, however, you decide to stay enrolled in Club Benefits you will be charged the regular monthly fee of $5.00/month. Yet another benefit is an Entertainment® SaversGuide® that lists thousands of hotels and restaurants where you can obtain discounts by showing your Savers Guide Membership Card. The directory also contains discounts to movie theatres and money-saving coupons from top national merchants. Also within the Club Benefits is a Cash Back Member Rewards Program where you can earn up to $40.00 a year just by turning in receipts totaling at least $100.00 each quarter. By participating in the Cash Back Member Rewards Program the benefits almost pay for themselves! To view a complete listing of all the benefits available please select the following links. The ISPFCU Club is available for members with an ISPFCU Checking Account and the Heritage Club is available for members with a Heritage Checking Account. Contact us at 800-255-0886 to get your access code for the Club Benefits website and to add the perfect complement to your ISPFCU Checking Account today!